My wonderful pet shelter, HotRescues, is located in the San Fernando Valley of Los Angeles. I was on my way there from my home when the earthquake struck yesterday morning. It wasn't a huge quake. And the HotRescues facility was recently remodeled, including upgrades to the older parts of it. All was well when I reached my shelter, although of course my nerves were rattled. Our security director Brooke Pernall was there, staying overnight as usual. So was her guy, LAPD detective Antonio Bautrell. They were both a bit shook up but had gone to check on all the animals, and everything was fine. I of course confirmed it by visiting all of our dogs and cats myself. By then, they were back to begging for food and attention--and I gave them both. If things hadn't been fine, we'd have found a way to take care of every one of the wonderful cats and dogs, even if we wound up doing the airplane rescue described in our most recent adventure, TEACUP TURBULENCE, in reverse--flying animals out of L.A. instead of here to be adopted. Here at HotRescues, our animals come first. We take care of them all and find them new, loving homes as quickly as possible. Not even an earthquake can stop that--or at least this one, fortunately, didn't. 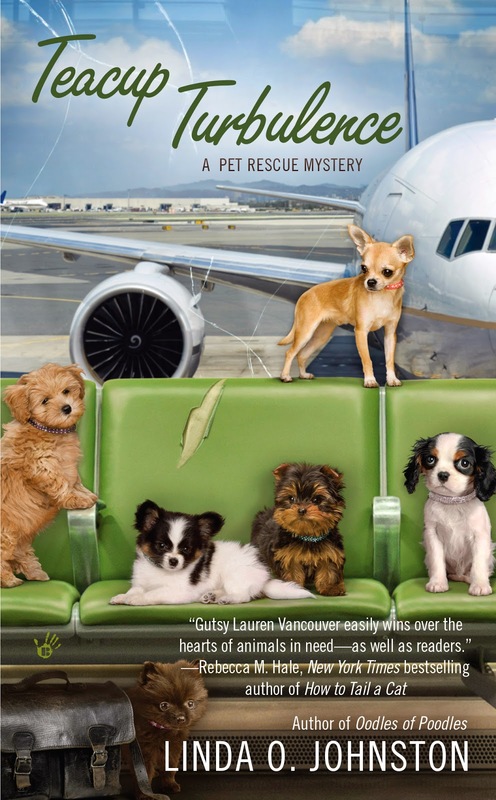 TEACUP TURBULENCE, the fifth Pet Rescue Mystery by Linda O. Johnston, was a January 2014 release from Berkley Prime Crime. I'm glad to hear everything and everyone was safe at your place. It woke me this morning, which was a good thing since I'd forgotten to set my alarm. Glad to hear the pets were fine. Sally-Forth and Tally-Ho don't like thunder. An earthquake might be even more scary for them. Yes, I was delighted that all the pets were fine. Linda told me that her own two dogs woke up but didn't seem particularly upset by the shaker. I can't relate to earthquakes but I can relate to turbulence. I was coming back from a trip overseas and for the last 13 hrs of the flight we hit turbulence. I called it "Turbulence over Tokyo" because that is when it started. Thank goodness all is well with you all.